Its the AFL grand final weekend but unfortunately for us in Tasmania we don't get a public holiday like Victoria does. So just before I head off to watch the grand final - here is the weekly recap..
Istanbul: I've had this for a few weeks now but couldn't seem to get it out on the table. Well it was worth the wait. Really enjoyed it! Only have played it with two players but I like the mechanics of this game and it's simple enough for most people to be able to play so it definitely wins in being accessible with some depth. Looking forward to playing it some more! No Thanks! : Not my most favourite of fillers, but playing in a group of non-gamers this is an easy one to pull out as its just cards with numbers and a few chips. The game gets going after about two minutes of explaining and it moves along fairly fast paced. There isn't much depth but there's the odd choice to make of whether to grab a card you need or try pass it around to collect more chips first - which can occasionally back fire. Incan Gold: Just bought this and had our first play last night. Simple. Easy to teach. Fast to play. Basic choices mixed with a lot of luck. This press your luck game is another that can be pulled out with anyone and followed on from our No Thanks! session to which I was surprised when most of the group preferred Incan Gold. I love the little tents and its a bit more exciting collecting precious stones rather than chips. A perfect filler game of fun for everyone. Camel Up: Finally got around to buying this. To be honest I think it's a little over rated but it can have a place in your game library for a bit of light gambling fun. Gotta admit, Camel Up does look pretty cool and it's good to have a game ready to pull out no matter who's at the table. This will be for one of those nights with mostly non-gamers as I try introduce more into the hobby. Incan Gold: Similar to Camel Up only I had never tried Incan Gold before purchasing it. Cool components, simple press your luck mechanics and a game to play with anyone. Think this might be an easier one to pull out than the aforementioned so might make it to the table more often. 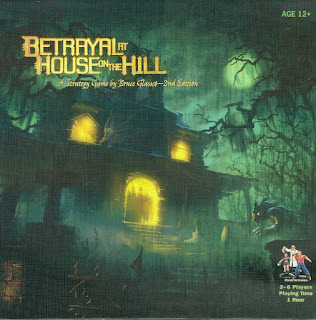 Betrayal At The House On The Hill: Long name but supposed to be an excellent game. I'm yet to try this but love the idea of exploring a haunted mansion that changes each game and the fact that one of our group will end up as a betrayer and try to stop us all from escaping! It sounds like a lot of fun, I've yet to crack it open or read the rules but imagine this one may be played sooner rather than later.. This is the one I was most excited about in this week's purchases! Labels: betrayal at the house on the hill , board game blog , board games , camel up , incan gold , istanbul , mostly board games , no thanks!